There is something particularly lovely about this time of year. With Thanksgiving and the buzz of the holiday season still several weeks away, we have a few quiet days to just be in the moment and enjoy the beauty of the changing season. Why not take advantage of the loveliness, and invite a couple of your closest friends together for a low-key Fall Harvest Party at home. This isn't meant to be a big complicated bash--there will be puh-lenty of time for that later on in the season--this one is all about spending time with some of your favorite people in the comfort of your home (no matter how tiny it might be!). A few friends, great food, and delicious cocktails served casually around the coffee table--what a great way to spend an evening! This season, I've teamed up with Smirnoff to bring you a series of posts on entertaining, simplified. 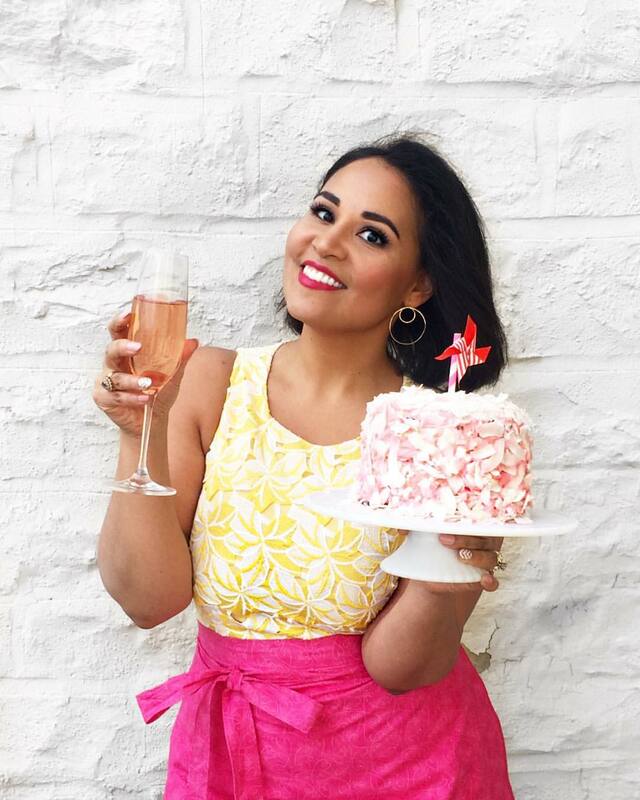 I'm going to be sharing monthly posts filled with creative entertaining ideas, recipes, and advice to help you get through the busy party season without the hassle. My goal is inspire you to create amazing moments for your friends and loved ones, because we all know that it's those times together that make the best memories. 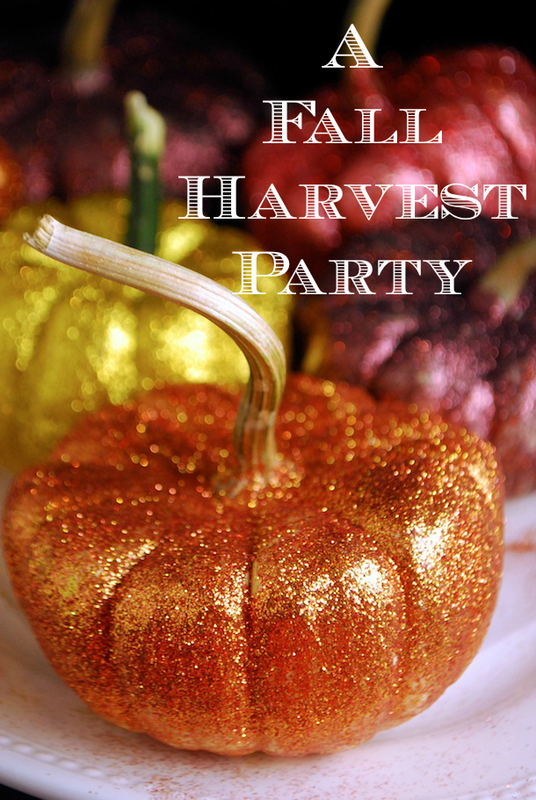 My Fall Harvest Party is the perfect example of this. Simple enough to host on a weekday evening after work, but with enough special touches to make it seem a little bit more festive than your average dinner or happy hour. You don't have to be a master mixologist with a full expansive bar. Instead, pick one or two signature cocktails that can be prepared in advance and have them ready to go as guests arrive. I suggest choosing something super simple, but with a special little touch that will instantly help your friends shrug off the cares of the day and relax into celebration mode. 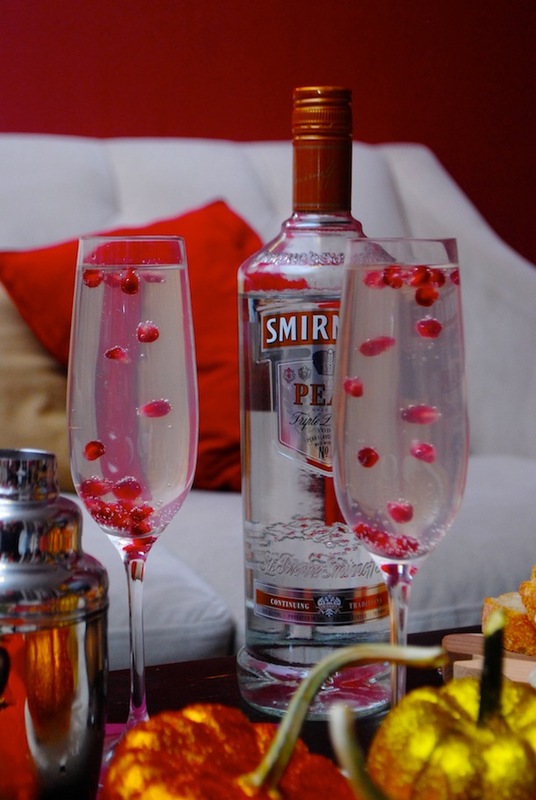 I welcomed my guests with flutes of an autumn-inspired Pear & Pomegranate Spritzer made with fragrant Smirnoff Pear vodka (one of my favorites from the Smirnoff flavored vodka line), seltzer, simple syrup, and a sprinkle of chilled fresh pomegranate arils. 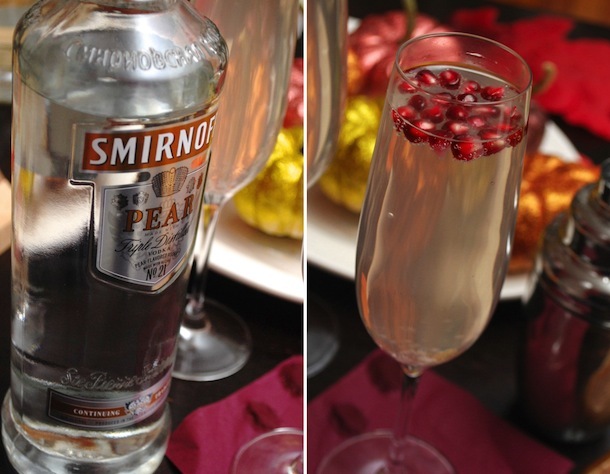 The bubbles in the seltzer make the pomegranate seeds dance around in the glass as your guests sip their drink! Click here for the cocktail recipe. Because the nights are getting colder, it's also nice to offer something hot at the end of the evening. Coffee or tea work well, but my current favorite is spiked hot apple cider. 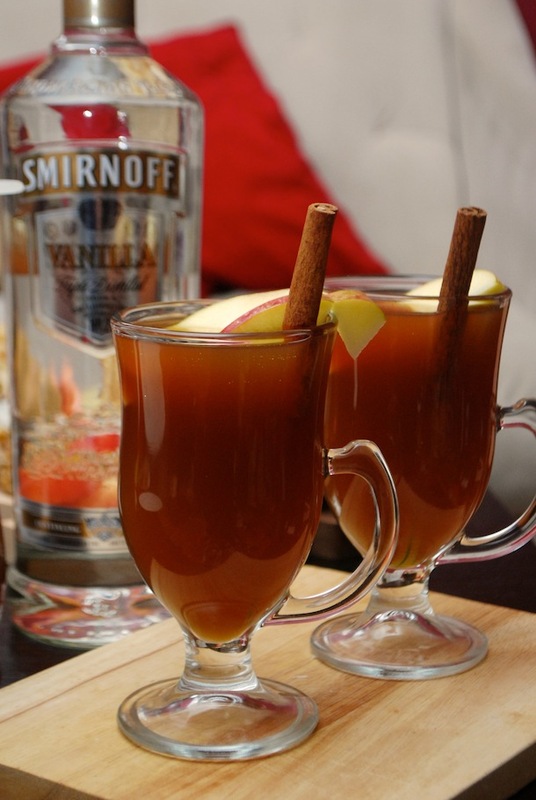 For this party, I prepared a batch of Hot Apple Pie Cider using local apple cider, whole spices, and Smirnoff Vanilla Vodka. 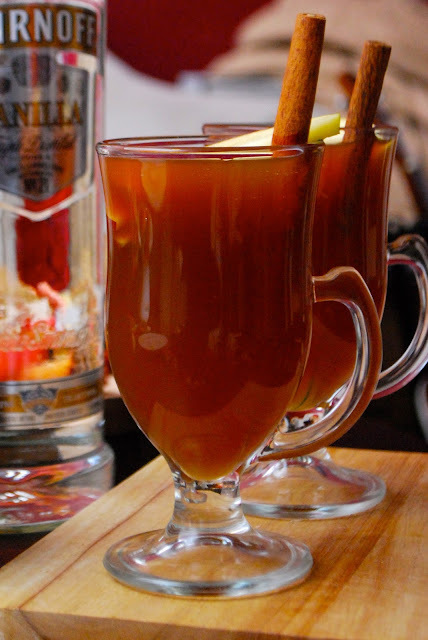 The sweet vanilla tones in the flavored vodka worked beautifully with the cinnamon and apples to create a warm and cozy adult beverage reminiscent of a classic apple pie. Keep the menu simple. One main course, a big salad, and an abundant cheese board are more than enough for a casual party like this one. We started with a big baby arugula salad studded with crisp local apples, toasted pecans, and a simple carrot-ginger dressing. By using pre-washed clamshell baby greens, this salad took mere minutes to assemble, but the little touches of apples and pecans made it really special. For the main course, I topped store-bought whole wheat naan flatbreads with some creme fraiche (cream cheese would also work! 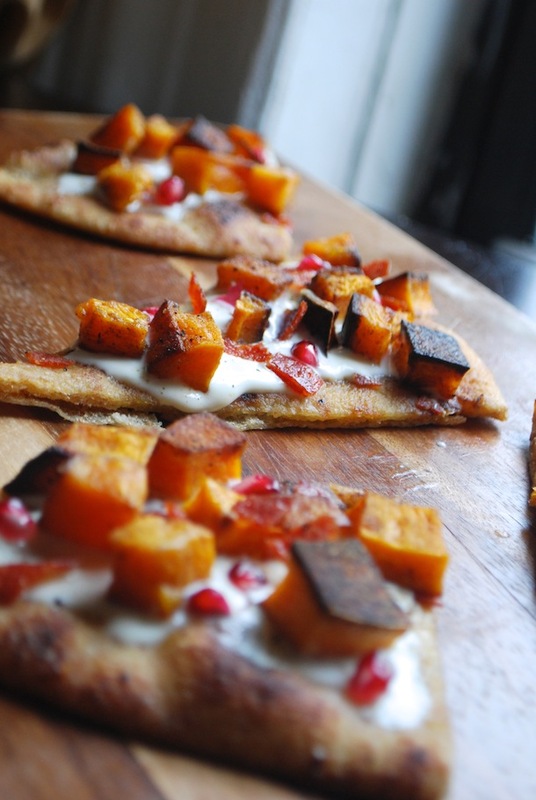 ), roasted butternut squash, and little bits of chopped chorizo. I suggest dicing and roasting the squash ahead of time so that all you have to do on party day is assemble and pop under the broiler for a couple minutes. 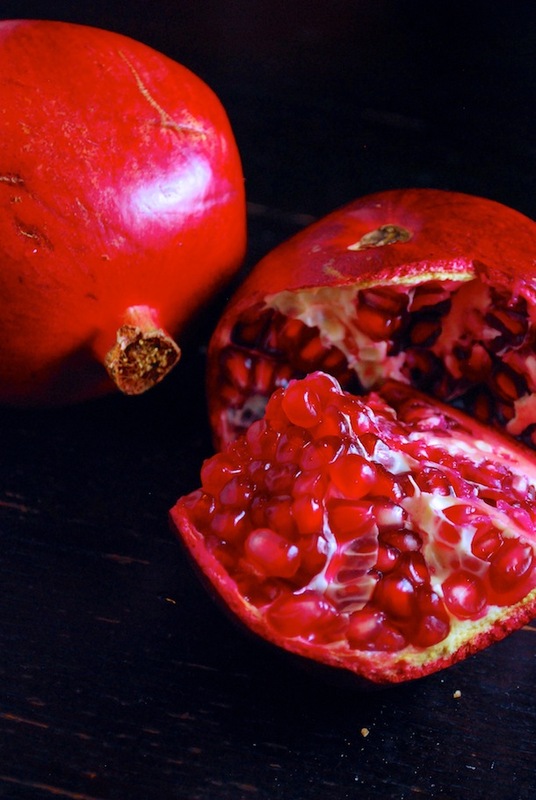 A sprinkle of pomegranate seeds on top just before serving adds a stunning seasonal touch that works nicely with the sweet squash and spicy chorizo, and pairs nicely with the pear cocktails. 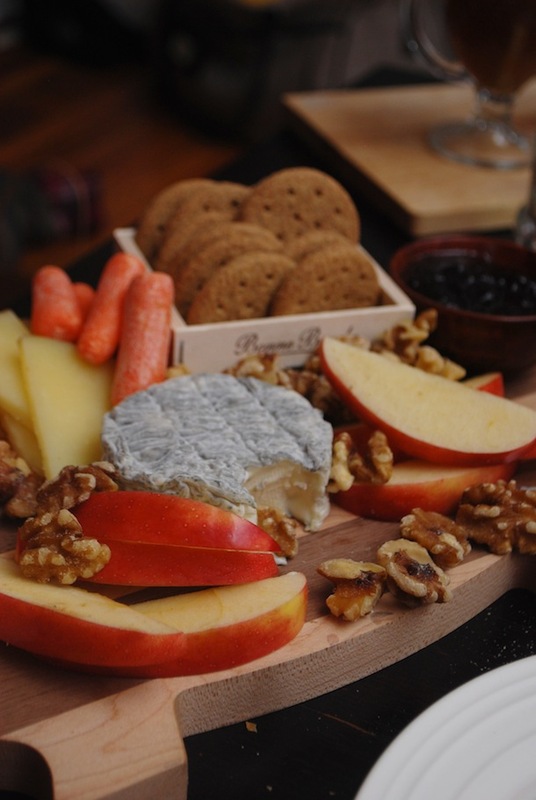 I never want people to feel like they have to leave once the main dishes are gone, so I love to put out a great cheeseboard for people to linger over. The sweet and savory flavors work beautifully with the cocktails, and will give your guests something to snack on while the conversation flows. I use a plain wooden cutting board and pile it with a couple kinds of soft and hard cheeses, some crusty sourdough bread from a nearby bakery, crackers, walnuts, carrot sticks, sliced fruit, and a little pot of onion jam. Oh and don't worry about labels or having a special knife for each cheese; just pile on the yummy things and let your friends enjoy! All parties need to end with something sweet! 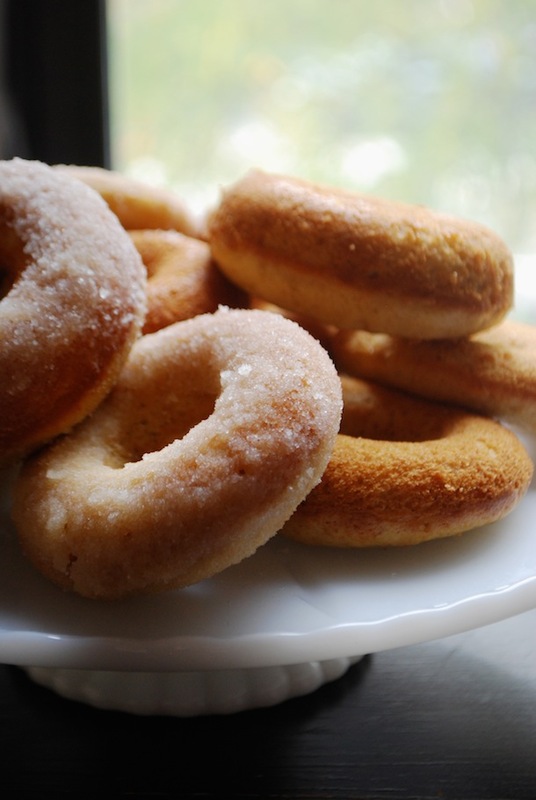 In keeping with the casual spirit of the evening, I offered up a pile of sugar-dusted Baked Apple Cider Donuts. No forks or plates required! For this party, I actually baked my own using a no-fuss one-bowl recipe (with a splash of Smirnoff Vanilla Vodka instead of extract! ), but if you're tight on time, you can also pick up a few bags of them from your favorite farmer's market or local doughnut shop. Hint: No matter where you get them, they're especially good when dunked into the aforementioned Hot Apple Pie Cider! The upside of entertaining in small spaces, is that you really only need a few little touches to create a festive environment. And you don't have to spend much money, either! While walking home from subway a couple days ago, I passed a street vendor selling little white pumpkins at a dollar a piece. I bought a bunch of them, and painted them with a mix of Mod Podge and glitter in shades of plum, bronze, and gold, and then piled them on a small platter to use as a centerpiece. Even better? These pumpkins will keep for weeks, so I can reuse them throughout the holiday season. Instead of a tablecloth or runner, I picked up a package of one-dollar paper leaves at the supermarket, and scattered them around the coffee table for a little extra Fall color. When looking down at them from above, they looked like leaves on the ground! I hope that you've enjoyed these ideas and use them as inspiration to create your own great parties! 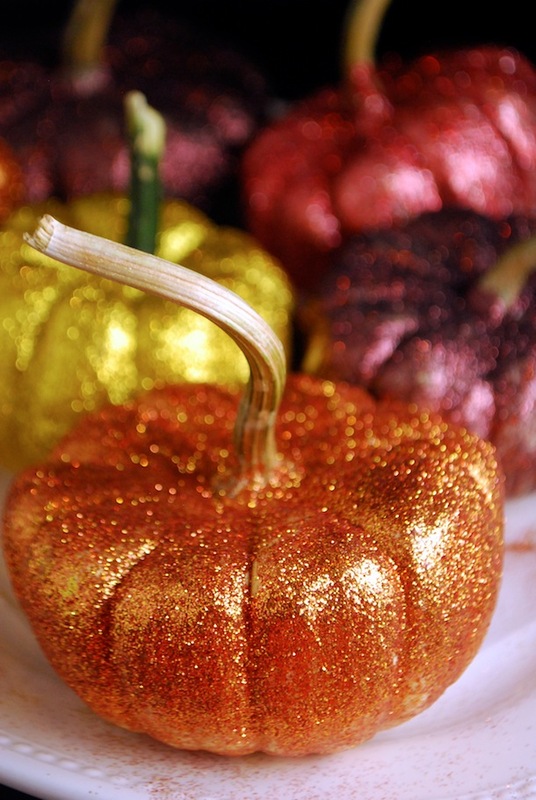 Let me know about any great fall party ideas you've spotted recently. 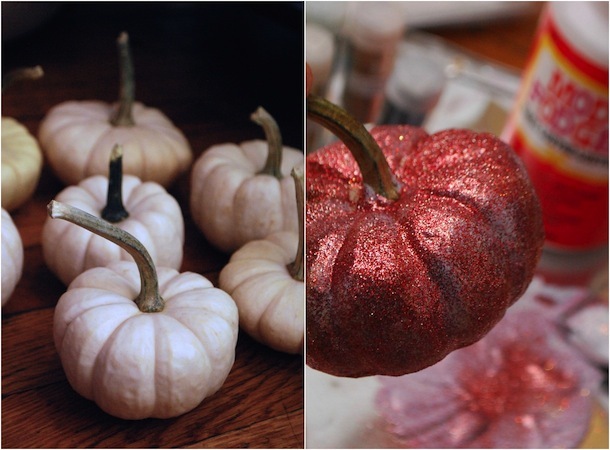 And click over to my Pinterest board for more Fall Entertaining Inspiration. Note: This post is sponsored by Smirnoff. Thank you for supporting great companies like Smirnoff that make it possible for me to keep creating fun new content for you to enjoy. All photos, opinions, and recipes are (of course!) my own.